This year marks the 200th anniversary of the Grimm brothers' collection of classic fairy tales. To celebrate, Philip Pullman, most famously the author of the His Dark Materials trilogy, has recently written a retelling of fifty of his favorites from the original collection. Penguin Books sent me a copy to review, and I have to say I was surprised---and ultimately happily so. Pullman maintains the Grimms' original style and much of the original language. This is not an embellishment or re-imagining of the original tales, which is what I had anticipated. Instead, Pullman has examined multiple translations and versions of the original stories, added a bit of detail, minutely shifted storylines here and there, and created this lovely new version that maintains a classic feeling. At the end of each of the fifty stories, he describes the sources he used and the revisions he made and his reasons for doing so. I love these extra analyses; they add so much to the stories that I'd never considered or known before. So. I was a little disappointed they weren't reinvented. But that was my own fault for misunderstanding what Pullman had done and why. Now that I know, I enjoy picking up the book and reading a tale or two while feeding my little baby five or six times daily. This is a great collection, especially nice for those who don't have time to sit for hours to finish a novel. 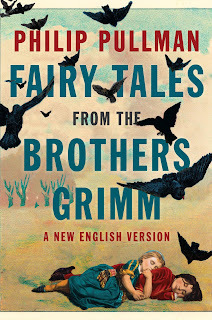 Now for the giveaway---if you would like your very own copy of Philip Pullman's Fairy Tales from the Brothers Grimm, leave your name and e-mail address to enter a drawing for a copy. Also, fill in the blank on this little phrase for me: Christmas wouldn't be Christmas without _______. The answer that comes to my mind, for instance, is The Carpenters. Love that Christmas album. I listen to it many times every December. What's a tradition or place you go or thing you must see/eat/listen to at Christmastime to really feel in the spirit? I love hearing about others' traditions. 1. Philip Pullman's collection of 50 fairy tales is great. 2. If you want to enter to win a copy, leave a comment with a) your name, b) your e-mail, c) Christmas wouldn't be Christmas without _______. 3. Giveaway is open now (December 29, 2012) through Friday, January 5, 2013. And here's a book trailer, in case you're interested. My husband would love this book -- especially with the analysis at the end of each story. Also, Christmas wouldn't be Christmas without scones. Sounds like a neat book! Christmas wouldn't be Christmas without driving around town at least once, looking for the most extreme and decorative Christmas light displays. Christmas wouldn't be Christmas without seeing Rudolph The Red Nose Reindeer Cartoon! I've heard good things about this book! And thanks for sharing the trailer. I hadn't seen it yet. For me Christmas wouldn't be Christmas without Chex Party Mix. We always have to make some!! c) Christmas wouldn't be Christmas without The Muppet's Christmas Carol, a live nativity and gobs of Christmas music!